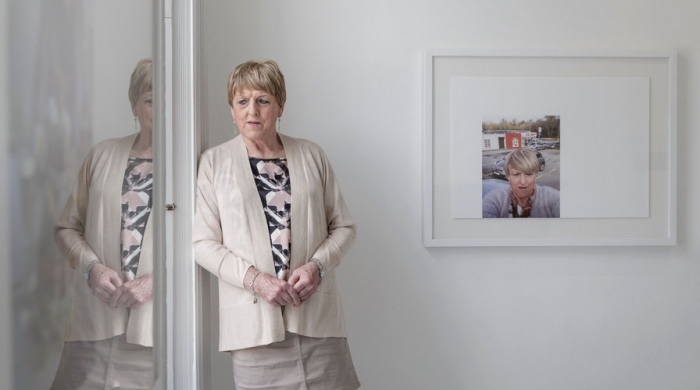 Becoming Christine is an exhibition based on the lived experience of Christine Beynon. It is a continually developing body of work involving re-presented “selfies”, sound installation and video portraiture. The “selfies” follow Christine Beynon’s journey and transition over the past 12 years. These self-portraits range in tone from the painful, to the playful, from the mundane to the contemplative to the joyful. The immersive sound installation & narrated artwork was a result of a collaborative partnership between the artist and Christine Beynon. The RHA presentation of Becoming Christine premiers the filmed video portrait of Christine to accompany the sound installation, photographs and accompanying publication. The video portrait depicts Christine outside her home in rural Galway; a home she self-built for her family. The legacy of Becoming Christine in combining specific artistic elements which together create an exhibition based in portraiture, is not only reflective of an individual finding themselves but is also reflective of the enormous socio-political change that has taken place in Ireland and England over the past sixty years. Christine’s ongoing and remarkable journey to full self-realisation and the bravery of this act, make her a true pioneer. ‘Every time I go outside my front door it’s a political statement.’ Christine Beynon, Interview 2012. Amanda Dunsmore explores how societal transformation is represented through portraiture. She works with video, sound, photography and installation. Through sculpture and media she has developed her practice over the past twenty-fiveyears. Her contextual portraits evolve through long periods of research and the work is often presented as a series of extensive socio-political / historical art projects. Central to Dunsmore’s art practice is an exploration of potential future memory in society, the accumulative legacy of portraiture in archiving history and the long-term value of socio-political art making. Amanda Dunsmore has exhibited widely in Ireland and internationally and her artworks can be found in private and public collections. Amanda is a lecturer and programme leader in Sculpture & Combined Media at Limerick School of Art & Design, LIT. Image: Amanda Dunsmore, Christine Beynon, Galway, 2017, Photographer Paul McCarthy, Image courtesy of the artist and Christine Beynon.